According to tradition Sts. Protus and Hyacinth were Romans by birth, brothers and servants in the house of St. Basilla. They were burned alive around 257, during the persecution of Valerian and Gallian. St. Hyacinth is unique among Roman martyrs in that his epitaph and grave in the cemetery of Basilla on the Old Salarian Way were found intact in modern time (1845); in it were the charred bones of the martyr, who had been put to death by fire. Part of the empty tomb of St. Protus was also found. According to the 1962 Missal of St. John XXIII the Extraordinary Form of the Roman Rite, today is their feast. The story of most martyrs of the first three centuries is so obscured by legend that it is difficult for us to cull out the historical kernel; this is true of today's saints. Tradition tells us that the brothers Protus and Hyacinth were chamberlains to the holy virgin Eugenia (listed as a martyr on December 25 in the Roman Martyrology) and were baptized along with their patron by Bishop Helenus. They devoted themselves zealously to the study of Sacred Scripture and lived for a time with the hermits in Egypt, illustrious for humility and holiness of life. At a later date they accompanied Eugenia to Rome and were arrested by Emperor Gallienus (260-268) for their profession of the Christian faith. In no manner could they be persuaded to deny the faith or worship the gods. Accordingly, after an inhuman scourging, they were beheaded on September 11. Veneration of the two martyrs in the Church of Rome dates to venerable antiquity. Ancient registers contain their names, Pope Damasus praises them in verse at the end of the age of martyrs. The cemetery of Basilla marked the site of their graves; relics of St. Hyacinth were discovered there in 1845 and now are honored in the chapel of the Propaganda. The unshakable fortitude of the martyrs throughout the Christian ages should serve as a stimulating reproach to us when we are tempted to lose patience under the most ordinary trials. Offer your Mass or Rosary for the grace of final perseverance. The holy confessor Paphnutius was an Egyptian, and after having spent several years in the desert, under the direction of the great St. Antony, was made bishop in Upper Thebais. He was one of those confessors who, under the tyrant Maximin Daia, lost their right eye, and were afterward sent to work in the mines. Peace being restored to the Church, Paphnutius returned to his flock. 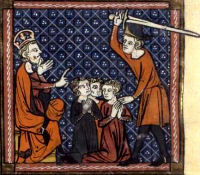 The Arian heresy being broached in Egypt, he was one of the most zealous in defending the Catholic faith, and for his eminent sanctity and the glorious title of confessor (or one who had confessed the Faith before the persecutors and under torments) was highly considered in the great Council of Nice. Constantine the Great, during the celebration of that synod, sometimes conferred privately with him in his palace, and never dismissed him without kissing respectfully the place which had once held the eye he had lost for the Faith. St. Paphnutius remained always in a close union with St. Athanasius, and accompanied him to the Council of Tyre, in 335, where they found much the greater part of that assembly to be professed Arians. Seeing Maximus, Bishop of Jerusalem, among them, Paphnutius took him by the hand, led him out, and told him he could not see that any who bore the same marks as he in defence of the Faith should be seduced and imposed upon by persons who were resolved to oppress the most strenuous assertor of its fundamental article. We have no particular account of the death of St. Paphnutius, but his name stands in the Roman Martyrology on the 11th of September. Read The Hermits by Charles Kingsley in which the introduction relates a story told by St. Paphuntius. It contains a miniature sketch, not only of the social state of Egypt, but of the whole Roman Empire, and of the causes which led to the famous monastic movement in the beginning of the fifth century after Christ.